The Q701 M71 Bi-Metal Bandsaw Blade is a bandsaw blade with unique features and use benefits. Bandsaw machine operators have different options when cutting certain types of materials. Carbon blades for wood and plastics, Bi-Metal blades for steels and metals, and Carbide blades for titanium and other exotic alloys. A Bi-Metal blade is capable of cutting hard and exotic alloys, and aside from a Carbide blade, a Bi-Metal blade can also cut hard materials such as Monels and alloys. The M-71 saw blade is a Bi-Metal blade designed to cut materials that the M-42 Bi-Metal blades can’t. The blade is effective at cutting Inconel, D2 Steels, Stainless Steels, Monels, and other exotic alloys. The M-71 has a large gullet capacity that improves chip carrying capacity when production cutting alloy and carbon steels. When cutting exotic alloys, the accuracy and blade life of the M-71 is increased by comparison with other bi-metal blades. Blade specifications for the M-71 bi-metal saw blade include a 15 ° positive rake angle, a Hi-Lo tooth height, a patented M-71 high-speed edge, and a varying set width. The M-71 saw blade has a higher tooth hardness than the M-42 bi-metal blade, which helps to reduce cut resistance. The M-71 bi-metal saw blade usually outlasts other saw blades in the production cutting of large diameter stock, work hardening steels, and nickel-based alloys with a tensile strength of up to 164,000 psi. 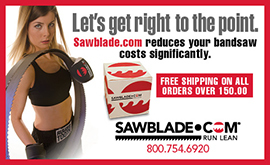 Please visit SawBlade.tv for more information about this unique bandsaw blade. This entry was posted in All Posts and tagged Bandsaw, Bi-Metal, M-71, Q701, sawblade.com, sawblade.tv. Bookmark the permalink.